Splend is creative, quick, to-the-point and most of all: specialised in tech. We happily dive deep into complex matter to reach your target audience with creative content. Offer relevant content consistently. Substantial and with appealing design: that’s what makes your brand an authority. Why does that work so well? The answer is quite simple: using content marketing, you approach the audience with valuable insights – not with a commercial message. Not your brand, but your audience is the focus. Before the audience ‘chooses’ you, you need to work hard on building trust. To win their trust, we first get to know them by creating personas with their characteristics. In these personas, we describe their pain points, successes, wishes and how that person likes to get his information. This is indispensable information in the process of creating content. Now it’s time to set targets. What would you like to accomplish? More sales conversations or a large number of registrations for your event? Do you need more brand awareness or do you want more downloads of your white paper? Together we make your targets measurable. By means of the personas and targets we define the subjects and themes we’re going to write about. 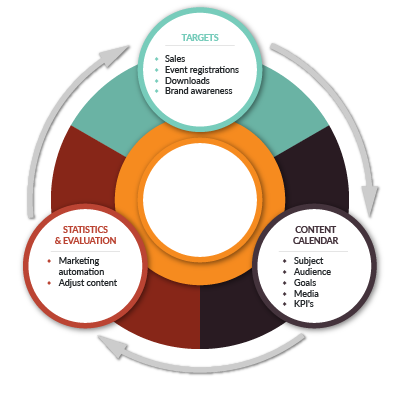 These types of content – with according KPIs – are documented in a content calendar, a nifty tool for writing and planning. Who engaged with your brand? How many views, downloads and shares did your content generate? How did your audience respond? You can measure this manually, but things get interesting when you make us of marketing automation. With data like this we can adjust content, targets and planning.